It was only one week ago that the Town Council held a lagoon mangrove cleanup. What better way to explain the importance of keeping our lagoons and wetlands clean than submitting a reef brief about them? Kayakers and nature lovers in general often find that the beauty of the mangroves and lagoons of Ambergris Caye offers great sight-seeing and a chance to see the “other side” of the island! Wetlands are areas where soil is saturated with water for prolonged periods of time. They are usually located in lowlying areas, covered with a shallow layer of water. Conservationists often refer to these ecosystems as giant sponges as a result of their effectiveness at absorbing and holding large amounts of water. This function becomes critical in preventing flooding during times of heavy rain like the rainy season. There are many other benefits that the characteristics of wetlands provide the surrounding environment and inhabitants with. For instance, the presence of seagrass and water hyacinths in this habitat help trap sediments and toxins from terrestrial run-off that would otherwise degrade the island’s ecosystem, not to mention the coral reef. Together with mangroves, wetlands also contribute to maintaining and stabilizing the island structure, as well as buffer the winds and waves of big storms. 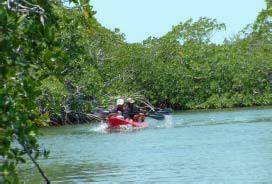 The wetlands present on Ambergris Caye can be defined as coastal wetlands. Coastal wetlands often extend from lagoons and form when fresh water flows from the land and mixes with the salt water from the sea. This brackish water has a high density of phytoplankton, as well as benthic microflora (algae) and macroflora (seagrass and mangroves), creating an area of very high productivity that attracts animals such as crocodiles and other marine life. Fish such as mutton snapper, cubera and tarpon reside in the lagoons, presumably using the habitat as a spawning and nursery ground. In addition, lagoon sinkholes connect to underground caves that occasionally offer up lobsters are found in this area. There is little doubt however, that of all the animals found in this ecosystem, the migratory and resident birds have most significantly become dependent on the area for food. For threatened bird species such as Roseate Spoonbills and Reddish Egrets, wetlands are considered a valuable feeding habitat, providing essential nutritional resources including fish.